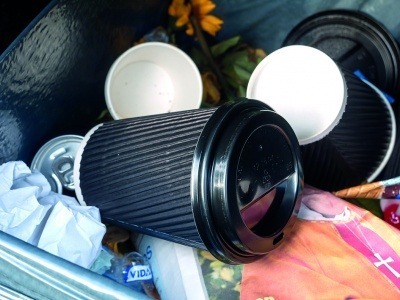 Waste management company Veolia has predicted that 2019 will see a 300 per cent rise in the number of coffee cups collected for recycling by the waste management company. The news that around 2.5 billion cups are thrown into residual waste bins every day in the UK, has resulted in the emergence of voluntary initiatives across the supply chain, especially in the first half of this year, with a number of retailers and reprocessors joining up to try and improve recycling rates. The problem with disposable cups is twofold. Firstly, they are most often purchased and used on-the-go, in busy consumer areas that tend to lack sufficient collection infrastructure – meaning many end up in the general waste stream. Secondly, they are made from a complex structure with a cardboard outer layer and a plastic inner layer, which general paper and plastic reprocessors cannot easily separate. Thus, people mistakenly placing the cups into general dry recycling bins could be unintentionally contaminating the recycling stream. However, two reprocessors have announced this year that they have the capability to recycle coffee cup waste. In March, packaging company DS Smith stated that it could recycle all the UK’s coffee cups at its paper mill in Kemsley, Kent, while on a smaller scale, paper manufacturer James Cropper launched its own trademarked ‘CupCycling’ process in May. There is also a growing push for better on-the-go recycling infrastructure to be put in place, which would allow for the separate collection of these items so that they can be taken to those recycling facilities with the capability to process them. Veolia has been at the forefront of this push, launching an office cup recycling service back in June 2017 with dedicated coffee cup bins being placed in workplaces. This year, the company has been working closely with coffee chains like Costa and Starbucks to widen the scope of its cup collections. Costa announced its aim to recycle as many coffee cups as it sells by 2020, equating to 500 million cups. The programme involves the chain subsidising a number of waste collection companies, including Veolia, to collect takeaway cups from stores (£70 per tonne collected). This subsidy aims to raise the value of coffee cups as a material in the eyes of recyclers, making it more financially viable to collect them. Veolia has also been working in partnership with Westminster City Council and the Heart of London Business Alliance on a three-month trial of dedicated coffee cup bins in the centre of London – which, with help from Veolia street sweepers, have apparently collected 100,000 cups so far. The cups are taken to Veolia facilities for sorting before being sent for recycling. The 120 million cups predicted to be collected in 2019 through all Veolia’s partnerships represents a 300 per cent increase on the amount collected this time last year. Richard Kirkman, Chief Technology and Innovation Officer at Veolia UK and Ireland, commented: “With a storm rightly brewing over disposable coffee cups in recent months, Veolia has responded by intensifying its efforts across the country to collect, sort and recycle millions of coffee cups which would otherwise be discarded. Our in-store and on the go solutions have real potential to capture every coffee cup in the country. Paper manufacturer James Cropper has set its sights on recycling some of the 2.5 billion takeaway coffee cups thrown away every year in the UK, partnering with London waste collection company Paper Round. Waste services firm Veolia has launched a national coffee cup recycling service for offices after research found that over half of regular takeaway hot drink consumers dispose of their cup at work. Environmental manufacturer Glasdon UK has launched a new eBook covering on-the-go cup recycling in a bid to increase consumer understanding and increase collections of the problem material.